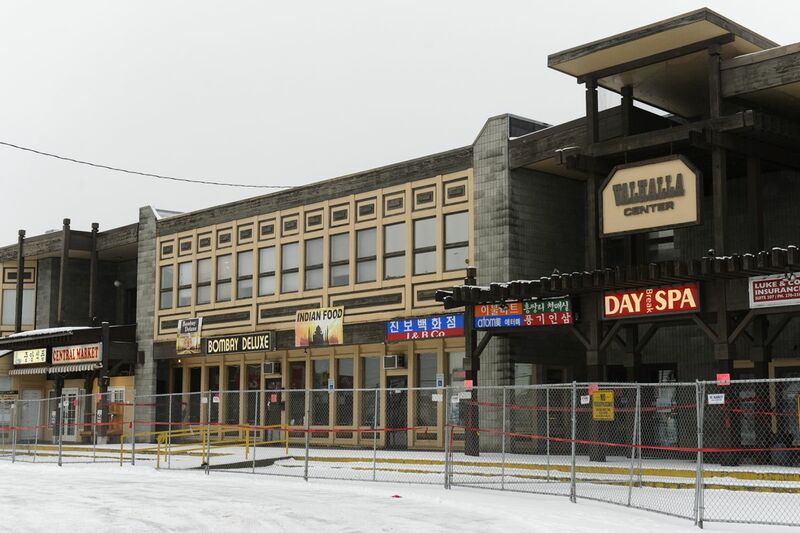 A commercial strip on West Northern Lights Boulevard in Anchorage was closed last week, related to damage from the Nov. 30 Southcentral Alaska earthquake, according to a city official. The parking lot at Valhalla Center, home to Bombay Deluxe, VIP Restaurant, New Central Market and a handful of other businesses, was empty Tuesday. Entrances to the building at 555 W. Northern Lights Blvd. were blocked off by a fence and red caution tape. The building is planning to reopen, according to a member of the family that owns the property. “To us, it’s pretty obvious the earthquake caused this damage,” said Ross Noffsinger, an acting building official with the Municipality of Anchorage, referring to concrete masonry walls that are detaching from the roof. "The north and east end of the building are where probably the most hazardous conditions exist,” he said. As of the end of December, city inspectors had identified more than 750 homes and buildings in Anchorage that had substantial damage from the November earthquake. Hundreds more had minor damage. In early January, the city learned about damage there and originally posted signs saying parts of the building were unsafe on the east end, where VIP Restaurant is located. The market and the Indian restaurant were still open at that point. The city told the owner to have a structural engineer look at the building to do a full evaluation. When the city got that full report, it decided to close the whole building down a little over a week ago, Noffsinger said Tuesday. “The engineer was able to take a much closer look at the building than we did, he found significantly more damage than what we had observed,” he said. The city gave the entire building a “do not occupy” status on Jan. 23, he said. “They’ve got some partial collapse potential at both ends of the building that they need to repair,” Noffsinger said. The building will open again “probably within a week to 10 days,” Said Obeidi said Monday. His family owns the Valhalla Center building. The property is “all closed for the safety of the tenants,” he said. Earlier this month, when just part of Valhalla Center was closed, Obeidi said the issue wasn’t from the earthquake but instead was due to ice and snow buildup on the roof. Parts of the trellis structure over a few of the building entrances are rotting from weathering over the years, and some became detached because of the earthquake, Noffsinger said. “Some of those timbers ... presented a fall hazard,” he said. The city has required the owners to fix that too, he said.